Hot Job is a paid job where we promise that we help you hire atleast one candidate. Once you post your job, our RPE (Relevant Profiles Extractor) algorithm will fetch you 100 hot profiles instantly based on your job criteria. Hot profiles are those candidates who are interested in your job and which are filtered based on several criteria. Additionally, we market every Hot Job across several mediums like Linkedin, Glassdoor and hence your job gets maximum applications. If you are new to our portal then, you can be able to post a job by clicking on any link which says “post a job” on Freshersworld.com. If you are an existing customer then you can post a job as mentioned earlier or else login to your employer’s account and click on “Post a job” on your dashboard. How can I differentiate free jobs, Featured Jobs and hot jobs in the dashboard? 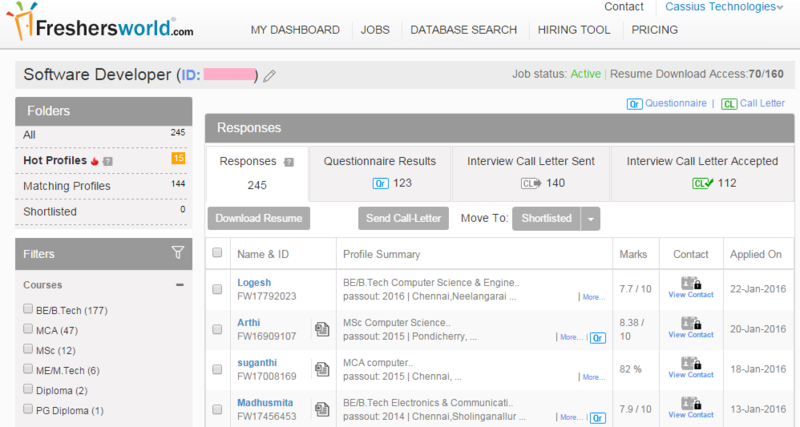 In the dashboard, you will find Featured Job and Hot jobs with their respective icons. Can I first post a free job and later make it a Hot job? Yes. Please note, it takes 24-48 hours to make a free job live. With the free job, you can view up to 5 contacts out of all the applications your job would receive and you will not be able to access 100 hot profiles. You can later upgrade to Hot Job but better you always post Hot Job to save your time and reduce effort so that it will help you hire quickly. Do I need to pay additionally for 100 hot profiles or it is included in Hot job post? It is included in the package. 100 Hot profiles are the complimentary profiles along with every Hot Job post. How many candidates will turn up upon posting the Hot job? Our hot job package standards are designed to get you 100 complimentary Hot profiles for every Hot Job post. To be true, you can close your job vacancies just by processing 100 Hot profiles. In addition to that, your job will be marketed to 2000 eligible candidates to get you maximum applications. Hence, your job will get up to 100 or more responses apart from 100 Hot profiles. RPE (Relevant Profiles Extractor) is a state-of-the-art algorithm which intelligently picks most relevant profiles based on your Job criteria. The profiles extracted out of RPE are those candidates who are most interested/probable candidates for your Job. RPE is a new age technology which is based on Machine Learning concept. RPE keeps a track on Job seekers activities like their Recent Job applications, Call Letter accepted, Type of Interviews attended, Activeness in Job search, and their profile updates like Preferred Job roles, Qualification, Preferred Job Location and Sub-Location. Whenever you post a Job or feed your requirement, RPE starts matching your Job requirements with Job seekers profiles. 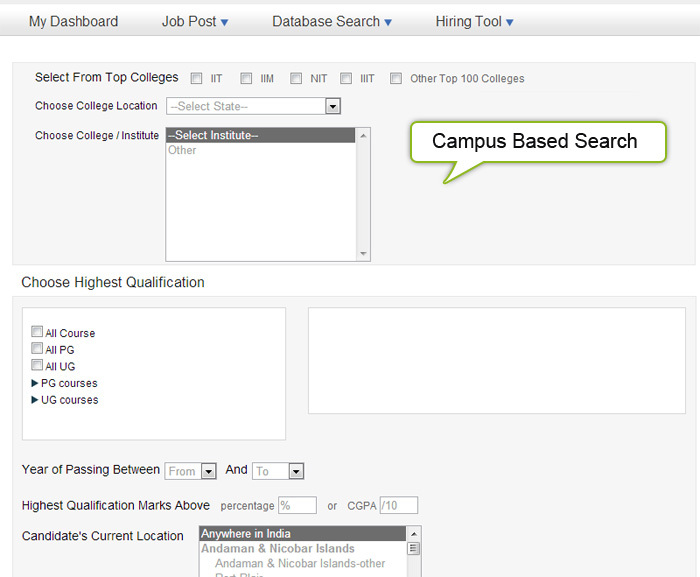 RPE quickly categorizes and sorts most relevant candidates out of our huge fresher database. Hence those sorted profiles are nothing but Hot Profiles. Every Job Posting instantly gets 100 Hot Profiles. So with RPE, one need not wait for Job applications to come in, by posting Hot Job you can immediately access Hot Profiles and start interviewing them. I have posted a Hot Job (Paid Job). Do I need to pay additionally for 100 Hot profiles? No. It's included in the package, you can go to the Hot Profiles Tab and start accessing your 100 Hot Profiles. Can I download Hot Profiles immediately and start calling those candidates? Yes. As soon as you post your Hot Job 100 Hot profiles will be ready for immediate download. What is unique about posting a Job on Freshersworld.com? Your Hiring Process starts as soon as you post your Job i.e you don't need to wait for Job applications to come in, you can immediately access 100 Hot Profiles and can call them for Interview. But in other Job posting websites, you need to wait for a minimum of 2-3 days to receive enough Job applications after posting a Job. I have edited my Job, will the 100 Hot Profiles be relevant to the new parameters? Yes, definitely. The RPE is a machine learning algorithm, which accurately predicts the 100 Hot profiles based on the latest updated job requirement. What makes Post-n-Hire different from other recruitment platform? Search fresher candidates based on various parameters like qualification, year of pass-out, skill set, college etc. Search candidates from India’s Premier colleges like IIT, IIIT, NIT, Top 100 Engineering colleges and IIM’s etc. Send SMS to candidates for a better turnout for Job Drive. What are the different subscription packages available for Post-n-Hire? Which one should I buy? Post-n-Hire is presently available with multiple subscription packages, one for each need. Please check in a given below link. For customized requirements, please contact us at: recruit@freshersworld.com or call us at: 8095335577. Where can I see the usage of my account? Employer Dashboard is a Dashboard which provides an overall view of the Employer’s account about the Recent Job Postings by Employer, recently saved search (hiring folders), Account Utilization status. Can I select Multiple Job Locations while posting a Job? Yes, you can select Multiple Job Locations while posting a job by selecting all the available options with a check box provided beside each location. How can I contact candidates from Post-n-Hire? Response Manager is a specific section in the Post-n-Hire that enables the employers/recruiters to manage his Job responses from candidates (candidates who had applied for the job). Using Response Manager you can track applicants, download the contacts and send call letters to them and see how many candidates will be attending the Job Drive. Once I posted a Job for how long my job will remain on Freshersworld.com? All jobs remain active on website until the last date of Job application as given by you while posting a job. Can I print a resume of a candidate? Yes, to print a resume, you have to click on the FWID link of the candidate and once his Global Resume is open, you can see the button called “Print”, you can click on this print option to take a Print out of candidate resume. How long will it take for my job to get live on Freshersworld.com website? It takes close to 30 minutes after the job is approved by the admin to come live on website. Can I re-post the same job again on the Freshersworld.com using existing expired Job? Yes, you can repost the same job with all new content or editing the content from Manage Job Postings/Responses by clicking on Edit link in the section. Please refrain from posting the same requirement as multiple jobs, as they will be rejected. What happens to my job once their last date is over? Once the Job last date is over the job posting will expire and will not be visible to candidates to apply. Can I edit the already Posted Job? If Yes, How can I do that? In this section you can listing of Jobs, select the specific job(s) and click on Delete link on it. Once clicked on Delete button, your Job will be removed from the website. How do I view the Job responses received for the job that I’ve posted? Can I view jobs that are expired from the site? Yes, you can view all the jobs which are expired in the Manage job postings/responses section under Job Post Tab. How can I send call letters to selected candidates? Please find the Send call letter button in Response manager. Select the candidates and then click on Send call letter button. How many call letters I can send for my job? With a free job you can send 10 call letters. With Hot job you can send upto 150 call letters. Can I use my own mail format/template to send call letter? No. You have to use our standard format which retrieves the job details automatically from the job details and the details provided by you while creating the call letters. You can preview the call letter before you send it to candidates. Can I use the same template that I created and used previously for sending call letter? Yes. You can find the previously used call letter templates, in select call letter template option. What is a Questionnaire and how do I use it? First round with candidates takes up a lot of time and this time can be utilized to sort out better candidates by just putting a questionnaire for your job. Ask the right questions and evaluate candidates even before meeting them. When can I create or add Questionnaire to my job? You can create or add questionnaire while posting your job itself. In case you have skipped questionnaire while posting the job, you can still add questionnaire later or anytime by editing the job from your Response manager. What type of questions should I add? How would you rate your English communication? If offered the role how soon can you join? Can you attend interview in 1 week (changes according to urgency) time? Do you accept the salary offered? Are you ok with the job location? Can I see the Answers of Candidates who attended the Questionnaire? Yes. You can see the answers of each and every candidate who have attended the questionnaire. Please find the Questionnaire result tab in your Response manager for that particular job. Can I Edit/add/delete/update the Questionnaire once the job goes live? How can I start searching for Resume? Resume search based on campus with candidates from across India. Quick Resume Search – Quick resume search enables you to search the candidates quickly from database based on basic search parameters like highest qualification, year of passout, marks, current location and candidate activation date on website. Click here to see the snapshot. Skill Based Search – Skill based resume search enables you to search the candidates based on skill set knowledge on various domain like VB, C, C++, Java etc. This knowledge can be from academic or learnt from any training institute and some work experience in same domain knowledge and rest of the search parameter will be the same as quick resume search. Click here to see the snapshot. Campus Based Search - Campus based resume search enables you to search the candidates based on a specific college or colleges based on states as well as from a top Premier Institutes like IIT, IIIT, NIT and IIM etc. 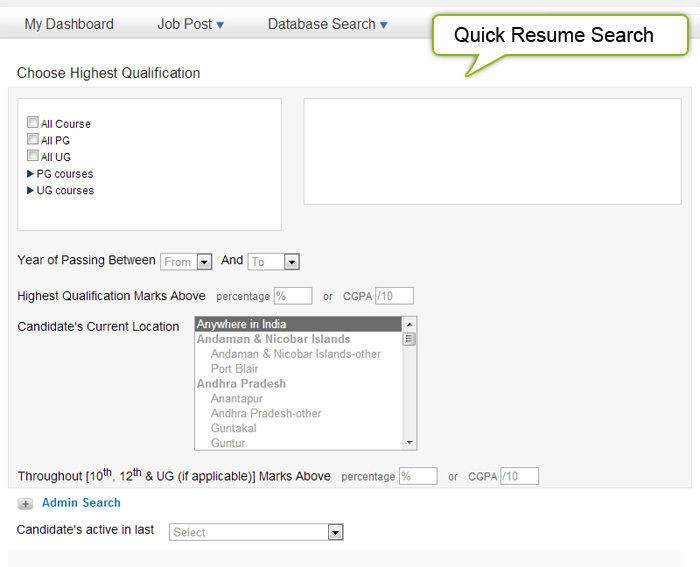 and rest of the search parameter will be the same as quick resume search. Click here to see the snapshot. How can I see the candidates contact details? How can I download the search results? You can download the search results by adding your search result to a folder and then select the download button. 1. How can I contact Freshersworld team? Can I have direct walk-in for candidates to my location? Yes we help with walk-ins but at an additional cost. Please connect with us on recruit@freshersworld.com for your walk-in requirement. How to get more applicants? Offer a competitive salary - Look up average salaries in the market and offer accordingly. Write a strong job description - Proper Job descriptions get 3x more candidates on average. Be sure to include key details, such as incentives, language requirements and timings. How to reach candidates and get them to show up for interviews? Call quickly - Call back candidates with 48 hours. Candidates are actively looking for jobs - the faster you reach them, the more likely they’ll pick up! Call smartly - Call candidates between 12pm-2pm and after working hours for best results. Remember, applicants are applying to multiple jobs - you need to convince them that yours is worth considering. Call candidates a day before and the morning for the interview. If you are the CEO or hiring manager, instead introduce yourself as you as an employee of the organisation. Candidates will be more comfortable asking you questions and giving you candid feedback. If I don't get responses, do I get refund of my money? Yes, while we ensure that your requirement is fulfilled and we have enough responses for your job opening if by chance you don't get enough responses then we will refund your amount. Conditions Apply. Hot Job is a paid job where we promise that we help you hire at least one candidate. Once you post your job, our RPE (Relevant Profiles Extractor) algorithm will fetch you 100 hot profiles instantly based on your job criteria. Hot profiles are those candidates who are interested in your job and which are filtered based on several criteria. Additionally, we market every Hot Job across several mediums like Linkedin, Glassdoor and hence your job gets maximum applications. 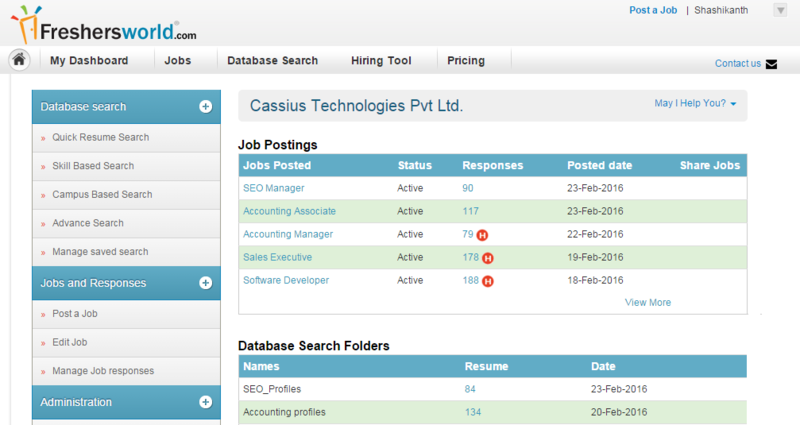 In the dashboard, you will find Featured Jobs with 'P' symbol and hot jobs with 'H' symbol. What are the three resume search modes available? How can I contact Freshersworld team?